So one of the things I missed out on in college was that whole ‘college life’ lifestyle. Being thrifty and living off of your meal plan and surviving with your school chums off what you had. I commuted to a school I hated, and so as soon as class was over I bolted home as soon as physically possible. One of the stereotypes I never got to enjoy were those adorable little lava cakes you make in the microwave. Because of this, I recently began looking up instructions for them online, and then decided to make my own much-needed revision. I say much-needed because most of the sites I’ve seen these posted on insist upon the use of self-rising flour or arbitrary measurements. Seems the makers of those recipes haven’t put together the foreign concept that baking a cake in your friggin microwave generally implies you can’t be bothered to know that self-rising flour is an actual thing. Not to mention, anyone who actually owns a bunch of self-rising flour probably has the means to simply make a pan of real brownies or molten cakes. Either way, here’s what I’m talking about. 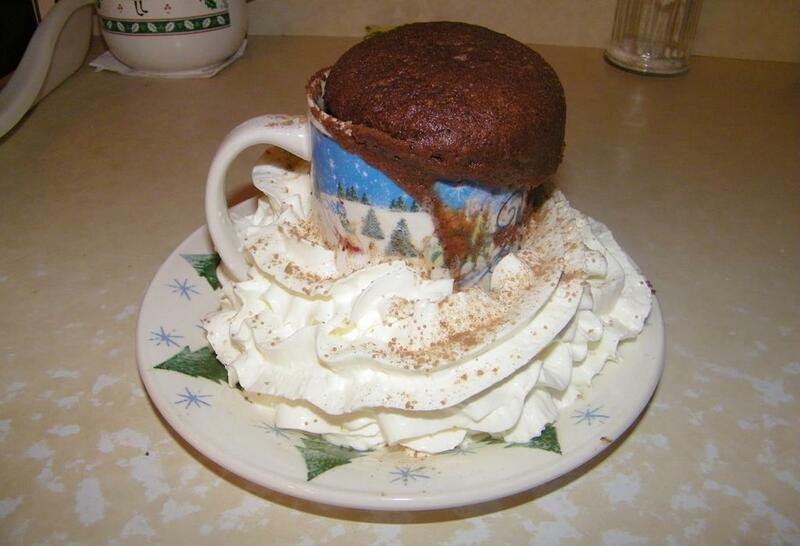 Mix ingredients together in a microwave-safe mug, one at a time, until thoroughly mixed. You can easily melt the butter in the mug before everything else, and then go in order. I know there’s some arbitrary measurements on the salt/baking powder, after criticizing other sites for doing the same, but I had to go the extra mile and perform math (ughhh) in order to eliminate the need for self-rising flour. Because as previously stated nobody cares about self-rising/cake flour. Regardless, those are integral to the recipe since otherwise it won’t rise. If you don’t have 1/8 tsp, just use a pinch. If it overflows, don’t panic, that’s supposed to happen. That’s why you cook it on a plate. I mean really, bear in mind, this isn’t a scientific, classical baked cake. It’s a bunch of stuff thrown into a mug designed for drinks, cooked in something generally designed to thaw vegetables and feed college students who are too high to operate an oven. Don’t expect anything fancy. Obviously I garnished the hell out of mine since I’m a shameless perfectionist. That’s really not necessary though since it’s delicious and doesn’t need it if you’re not a neurotic wreck like me. A word of advice though, when you add the chocolate chips at the end, try to keep them towards the top. If you push them down, they’ll just sink to the bottom and you’ll end up with a cake that’s only molten at the bottom, which isn’t very molten TBQH. Otherwise it’s amazingly straightforward. The only thing easier than this is buying a Kid’s Cuisine frozen meal, cutting out the brownie and throwing the rest away. But leeet’s try to avoid that if at all possible. Posted on December 13, 2012, in Cheat Codes and tagged CHOCOLAAAATE, Classy, Delicious, dessert, easy, recipes, snacks. Bookmark the permalink. 1 Comment.